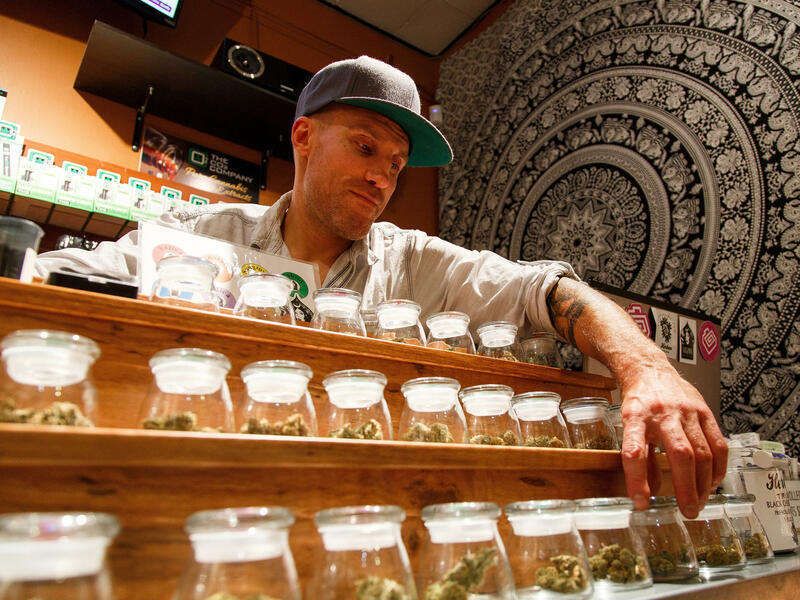 Shane Cavanaugh, owner of Amazon Organics, a pot dispensary in Eugene, Ore., arranges the cannabis display in his store in September 2015. People attend the Cannabis World Congress Expo on June 19, 2015, in New York City. The fledgling legal market for marijuana is around $7 billion, industry researchers say. About 60 percent of Americans now live in a state where cannabis is legal or soon to be legal in some form. And with marijuana use on a steady march toward normalization, if not outright national legalization, the booming cannabis industry appears bound for even greater growth. The smell of money is in the air. "Support for legal cannabis was one of the few mandates voters in both red and blue states delivered" Nov. 8, said Brendan Kennedy, CEO of the marijuana-focused private equity firm Privateer Holdings. Since the passage of the eight ballot measures, he says there's been a surge of interest from investors "who recognize that the end of cannabis prohibition is inevitable." The marijuana market has some unique characteristics that make it attractive to investors. And also some unusual risks. The big draw comes down to basic math: The fledgling legal market for marijuana is around $7 billion, according to New Frontier and ArcView Market Research. That's big, but dwarfed by what Kennedy says is the overall $50 billion U.S. market, most of which remains illegal. So as legalization gains steam, the black market shrinks and legitimate investors and businesses stand to monetize tens of billions of dollars. It's not all clear sailing, however. While polls show that about 60 percent of Americans now favor legalization of marijuana, cannabis remains illegal under federal law, a Schedule 1 drug like heroin or LSD under the Controlled Substances Act. And because of federal prohibition, marijuana businesses are largely barred from using the banking system. None of this seems to have discouraged the growing legion of marijuana entrepreneurs. Olivia Mannix, co-founder of the Denver-based marijuana marketing firm Cannabrand, says the "phone has been ringing off the hook" with calls from potential clients since the ballot measures passed. In response, she says she plans to quadruple her staff of six in the first quarter of 2017. "I'm not only hiring more employees, but strategic leadership level positions, a strategic adviser for quick growth," she says. The growing scale of the marijuana industry has made it more professionalized, more corporate. In Colorado, where recreational marijuana became legal in 2014, there's consolidation — mergers and acquisitions among operators. There's an array of products beyond smokable cannabis. Edibles, capsules, gels, lip balm, even THC-infused "personal lubricants." There are products marketed to sore-jointed boomers, products for people with chronic diseases, edibles curated specially for vegans. The singer Melissa Etheridge just announced plans to make cannabis products for medical patients in California. "I'm right in the process of branding," she told Billboard. As the so-called "green rush" gains momentum and legitimacy, professionals are increasingly willing and eager to offer their expertise. "The support around the industry is growing," said Adam Bierman, CEO of MedMen, an investment firm for the legal marijuana business. "Accounting firms, legal firms. All the different professional services that because of the position we were in a year ago, two years ago, three years ago, with the stigma around the industry, those people wouldn't work for us." Now they do, he adds. Bierman says the financial backing flowing into legal marijuana has come from wealthy individuals or companies that manage assets for affluent families. Discreet, quiet money. Not Wall Street, not institutional investors like mutual funds. But he expects that to change. "I think we'll see it in 2017," Bierman says. While the marijuana business is gaining traction in the corporate world, there also are signs of excessive exuberance. "I think this industry at this point is very similar to what I saw in technology and the Internet in 1998 and 1999," said Kennedy of Privateer Holdings. Those were the years right before the dot-com crash. Kennedy says marijuana investors should be careful. Alan Brochstein of 420 Investor goes even further. He says watch out for scams. Brochstein tracks marijuana stocks traded on the lightly regulated over-the-counter market. He says there were only a handful of publicly traded marijuana stocks when he started following them in 2013. "Now I'm tracking 400 companies in North America ... purported marijuana companies." Many are financial mysteries, says Brochstein, since they are not registered with the Securities and Exchange Commission and are not required to be. "They just keep popping up. Most of them are not legitimate." 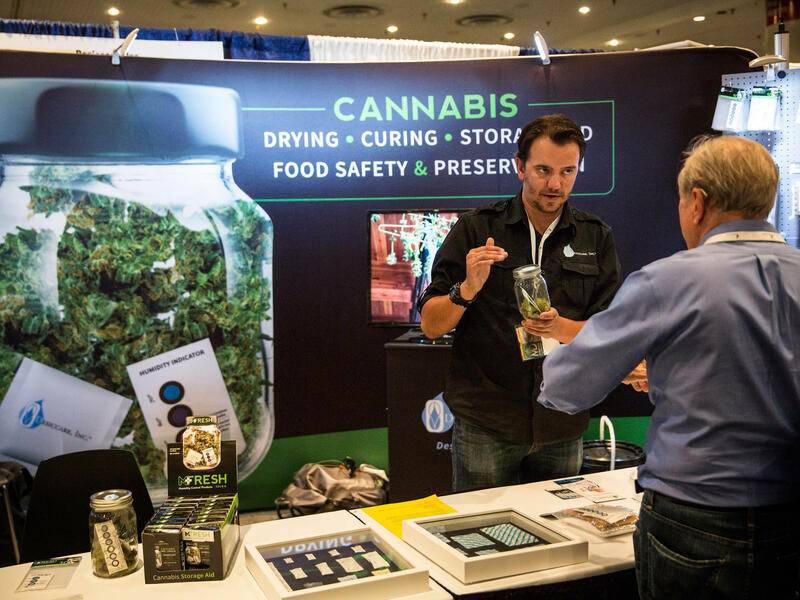 While he's dubious of most marijuana stocks, Brochstein thinks the overall industry — companies cultivating and selling marijuana and developing products and services — will thrive. He's not as giddy as others in the business about this month's election results. Brochstein says the Republican sweep of the White House and Congress could doom an act in Congress that would end the federal ban on medical marijuana. But Brochstein believes there's no turning back in terms of public support for legalization. And like others in the business I spoke to he dismissed the possibility that the industry could be derailed by research showing harmful effects from long-term marijuana use. "People are still smoking cigarettes. We know there are problems with that," Brochstein says. "People are drinking alcohol. We know there are problems with that. Opioids are legal. We know there are problems with that. I think that over time research will bear out there are pros and cons to the consumption of cannabis. ... I think it's much easier to deal with that in a regulated world than a black market. I don't see that as a deterrent for the progress of the industry."